If you’re exhibiting at a tradeshow, there’s no denying which promotional product is a must for your event: custom pens. They’re one of the most popular tradeshow giveaways, and people expect them at your booth. A lot of reasons, actually. Pens appeal to the masses. Fifty percent of U.S. consumers own writing instruments, according to the Advertising Specialty Institute (ASI). Pens are one of the most affordable promotional tools. Logo pens and pencils tie bags for the lowest cost-per-impression in the U.S., according to ASI. Pens get your brand remembered. Two-thirds of people can recall the name of the advertiser who gave them a pen within the last 12 months, according to Promotional Products Association International (PPAI). People find pens functional and relevant. PPAI reports that 73% of people carry a pen with them at all times. 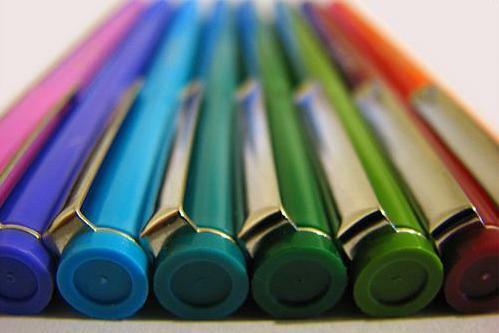 People use pens – often multiple times a day. Thirty-nine percent of people use a pen approximately 10 times a day, according to PPAI, and 21% use pens about five times a day. Seventy-six percent of people consider the pen an important, very important or extremely important part of their daily activities, according to PPAI. A pen is a promotional product that puts your logo right where you want it – directly into the hands of your customers. Our client, Kayla Melbye with PureCare, a mattress protection and accessories supplier, turned to ePromos for custom pens. She wanted a useful, functional promotional product to hand out at the 2014 Las Vegas Market, the leading furniture, home décor and gift tradeshow. But here’s the thing – the pens weren’t just for attendees to pick up as they passed by. The pens served a purpose on the spot. PureCare launched a new pillow line, PureCare One, at the show, and the company wanted to get attendees’ feedback on the new pillows. The pens served two purposes: They helped PureCare collect immediate insight about its new line of pillows, and they were a useful takeaway for attendees who stopped by. That brings us to a great promo lesson: Any time you’re handing out pens – at a tradeshow or otherwise – always pay attention to the presentation. How they’re offered to customers makes a big impact on the perception of your brand. If they’re corralled neatly in a bowl or jar, it makes your brand appear smart and organized. But if the pens are strewn all over the countertop, or if there are boxes of pens scattered around your booth, it doesn’t reflect well on your company. Pen presentation matters. Melbye ordered 1,000 custom pens and gave them all away. It’s not surprising considering that 50% of people always pick up a promotional pen being given away, according to PPAI research. People love free stuff, and people love pens. If you’re looking for that one must-have promotional product for your next tradeshow, pens are the perfect pick.